Tomorrow is picture day at my kids’ elementary school, and this year is a big one: my daughter is in fifth grade. While the children in the other grades usually sport a range of attire (with my kids typically at the most casual end of the spectrum), fifth graders are supposed to step it up significantly. Fifth grade boys traditionally wear dress slacks, button down shirt, tie, jacket and dress shoes. Fifth grade girls traditionally wear dresses. I offered multiple times to take her shopping for a new dress, but each time I was quickly dismissed (my daughter, God bless her, takes after her mother in finding clothes shopping excruciatingly boring). 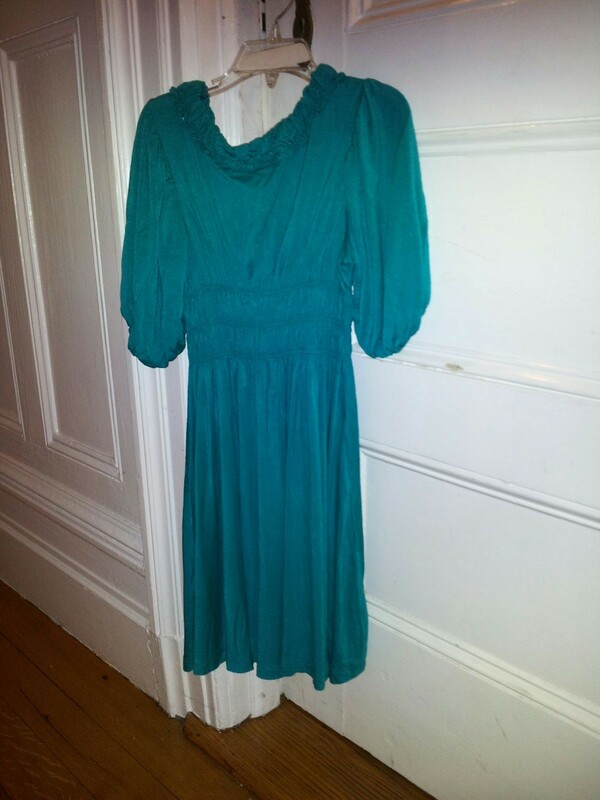 But heck, she had a dress, so it was one thing I could cross off the to-do list. Until today, when Emmy decided she didn’t want to wear a dress for picture day. Although I’m still not sure what provoked this change of heart, it came after we had just learned that one or two other girls had also expressed a desire to opt-out of the dress requirement. My husband, being even more laid back about these things than I am, had told Emmy she could do whatever she wanted. However, after some thought I was less sure. I had seen the fifth grade kids at school every year all dressed up on picture day. It’s a tradition, part of their rite of passage, a way of identifying themselves as the ‘seniors’ of the elementary school world. Dressing up is a sign of respect. It’s just what everyone is supposed to do. Then there’s also the issue of precedent. My twin boys will be in this same position the year after next, and one of them at least has insisted on wearing pretty much nothing but sweatpants since he was three. If I let Emmy buck tradition, where would that leave me with my sons? So I told Emmy she needed to wear a dress. When I told her I saw her face fall, and that look of disappointment I’ve seen so often. The fact is, Emmy is different. She likes to be different. She’s an artist, a voracious reader, and a dreamer. If given the choice, she’d wear black leggings and some funky sparkly top all year long. Every time I’ve tried to get her to do what other kids her age are doing, it’s been a disaster (i.e., team sports). She’s also very comfortable being who she is. In a word, she’s awesome. But the question is, are there times when you need to conform? Like wearing a suit to an interview, or standing up and putting your hand over your heart to say the Pledge of Allegiance. I want to raise Emmy so that she embraces her individuality, but also knows when she needs to fall in line. So I felt like I’d made a good parenting decision, and Emmy seemed to accept it. I began to panic. Was making all the kids adhere to this dress code a similar kind of ‘mindless conformity’? By forcing Emmy to respect tradition, was I inadvertently passing on the message of this poster to ‘be just like every else’, that ‘individuality causes pain’? Was God trying to talk to me through a Captain Underpants book? It seemed a little improbable, but truth has come from weirder places….I think. So after I put the boys to bed, I went to Emmy and asked her how strongly she felt about the whole dress thing. She said she was OK, but she really would prefer to wear leggings and this cool black and blue shirt she has. I told her that was OK. She could wear what she wanted to school, and just bring the dress as back-up, if she changed her mind. Her face lit up again. Maybe individuality doesn’t cause so much pain after all. 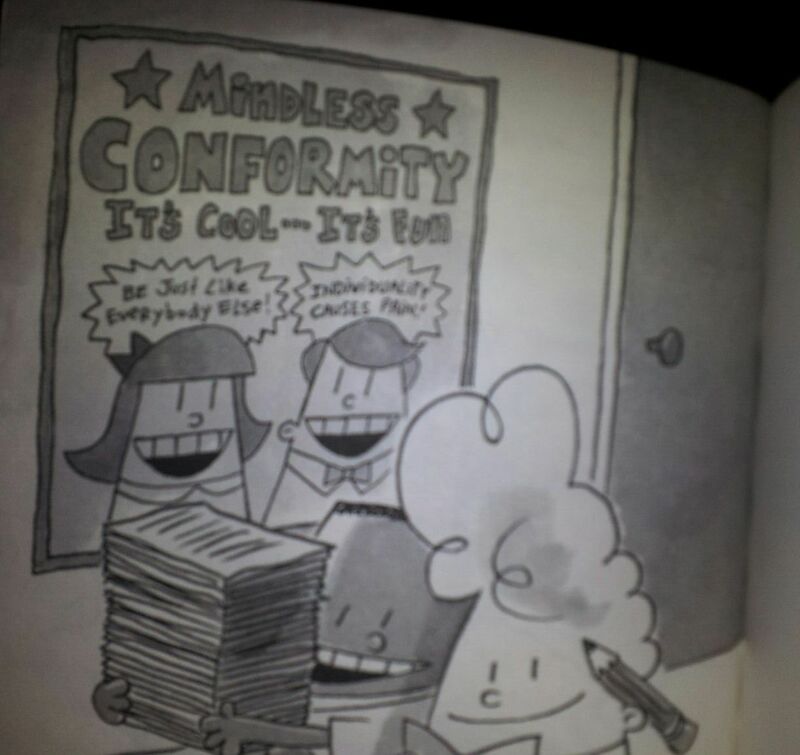 This entry was posted in Parenting and tagged Captain Underpants, conformity, Faith, Jesus, parenting, picture day. Bookmark the permalink.